(4)資料主要來自 Gazetteer of Planetary Nomenclature 和 NASA factsheet. ^ 1.0 1.1 1.2 Historical Background of Saturn's Rings. [2006-03-08]. （原始内容存档于2012-09-12）. ^ 3.0 3.1 Baalke, Ron. Historical Background of Saturn's Rings. Saturn Ring Plane Crossings of 1995–1996. Jet Propulsion Laboratory. [2007-05-23]. （原始内容存档于2009-03-21）. ^ Saturn's Cassini Division. StarChild. [2007-07-06]. （原始内容存档于2007-07-04）. ^ James Clerk Maxwell on the nature of Saturn's rings. JOC/EFR. March 2006 [2007-07-08]. （原始内容存档于2008-09-28）. ^ Cornell University News Service. Researchers Find Gravitational Wakes In Saturn's Rings. ScienceDaily. 2005-11-10 [2008-12-24]. （原始内容存档于2011-04-02）. ^ Nicholson, P.D. and 16 co-authors. A close look at Saturn's rings with Cassini VIMS. Icarus. 2008, 193: 182–212. doi:10.1016/j.icarus.2007.08.036. ^ Zebker, H.A., Marouf, E.A., and Tyler, G.L. Saturn's rings - Particle size distributions for thin layer model. Icarus. 1985, 64: 531–548. doi:10.1016/0019-1035(85)90074-0. ^ Rincon, Paul. Saturn rings have own atmosphere. British Broadcasting Coorperation. 2005-07-01 [2007-07-06]. （原始内容存档于2007-08-24）. ^ Johnson, R. E. The Enceladus and OH Tori at Saturn. The 美國天文學會. 2006 [2007-07-07]. ^ Schmude, Richard W Junior. Wideband photoelectric magnitude measurements of Saturn in 2000. Georgia Journal of Science. 2001 [2007-10-14]. （原始内容存档于2007-10-16）. ^ Schmude, Richard, Jr. Wideband photometric magnitude measurements of Saturn made during the 2005-06 Apparition. Georgia Journal of Science. 2006-09-22 [2007-10-14]. （原始内容存档于2007-10-15）. ^ Schmude, Richard W Jr. SATURN IN 2002-03. Georgia Journal of Science. 2003 [2007-10-14]. （原始内容存档于2007-10-16）. ^ The Journal of the British Astronomical Association. 英國天文協會. February 2003 [2007-07-07]. （原始内容存档于2007-09-28）. ^ Baalke, Ron. Historical Background of Saturn's Rings. 1849 Roche Proposes Tidal Break-up. Jet Propulsion Laboratory. [2008-09-13]. （原始内容存档于2009-03-21）. ^ The Real Lord of the Rings 互联网档案馆的存檔，存档日期2008-09-21. ^ Saturn's Rings May Be Old Timers. NASA/JPL and University of Colorado. 2007-12-12 [2008-01-24]. （原始内容存档于2007-12-20）. ^ O’Donoghue, James; Moore, Luke; Connerney, Jack; Melin, Henrik; Stallard, Tom; Miller, Steve; Baines, Kevin H. Observations of the chemical and thermal response of ‘ring rain’ on Saturn’s ionosphere. Icarus. 2018-11. doi:10.1016/j.icarus.2018.10.027. ^ Hamilton, Calvin. Saturn's Magnificent Rings. 2004 [2007-07-25]. （原始内容存档于2007-08-08）. ^ Malik, Tarig. Cassini Probe Spies Spokes in Saturn's Rings. Imaginova Corp. 2005-09-15 [2007-07-06]. （原始内容存档于2007-07-14）. ^ Williams, David R. Saturnian Rings Fact Sheet. NASA. [2008-07-22]. （原始内容存档于2011-08-23）. ^ 29.0 29.1 Esposito, L. W. Planetary rings (pdf). Reports On Progress In Physics. 2002, 65: 1741–1783. doi:10.1088/0034-4885/65/12/201. ^ H. Karttunen, P. Kröger, ed al. Springer, 编. Fundamental Astronomy 3. Helsinky. 2000: 221. ^ 39.0 39.1 Cassini-Huygens press release NASA Finds Saturn's Moons May Be Creating New Rings 互联网档案馆的存檔，存档日期2006-10-16., 11 October, 2006. ^ Davison, Anna. Saturn ring created by remains of long-dead moon. NewScientist.com news service. 2007-08-02 [2009-01-03]. （原始内容存档于2008-07-08）. ^ 42.0 42.1 Porco C. C., et al.. More Ring Arcs for Saturn. Cassini Imaging Central Laboratory for Operations web site. 2008-09-05 [2008-09-05]. （原始内容存档于2008-10-10）. ^ NASA Space Telescope Discovers Largest Ring Around Saturn. [2011-08-12]. （原始内容存档于2011-06-05）. ^ 48.0 48.1 48.2 Cowen, Rob. 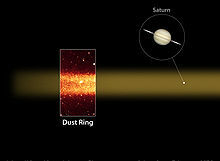 Largest known planetary ring discovered. Science News. 2009-10-06 [2011-08-12]. （原始内容存档于2011-10-06）. ^ The King of Rings. NASA, Spitzer Space Telescope center. 2009-10-07 [2009-10-07]. （原始内容存档于2009-10-10）. ^ Grayson, Michelle. Huge 'ghost' ring discovered around Saturn. Nature News. 2009-10-07. doi:10.1038/news.2009.979. （原始内容存档于2009-10-10）. ^ Weil, Martin. U-Va., U-Md. astronomers find another Saturn ring. Washington Post. 2009-10-25: 4C. ^ Denk, T.; 等. Iapetus: Unique Surface Properties and a Global Color Dichotomy from Cassini Imaging. Science (AAAS). 2009-12-10, 326 (5964): 435–9 [2009-12-19]. Bibcode:2010Sci...327..435D. PMID 20007863. doi:10.1126/science.1177088. （原始内容存档于2009-12-16）. ^ Lakdawalla, E. A Ringed Moon of Saturn? Cassini Discovers Possible Rings at Rhea. The Planetary Society web site. Planetary Society. 2008-03-06 [2008-03-09]. （原始内容存档于2008-03-10）. ^ 58.0 58.1 土星光环下的雨，卡西尼号尝了尝. 果殼科技. 2018-10-29. ^ NASA：土星环正在被土星“吃掉” 寿命已减少2亿年. 環球網. 2018-10-28.